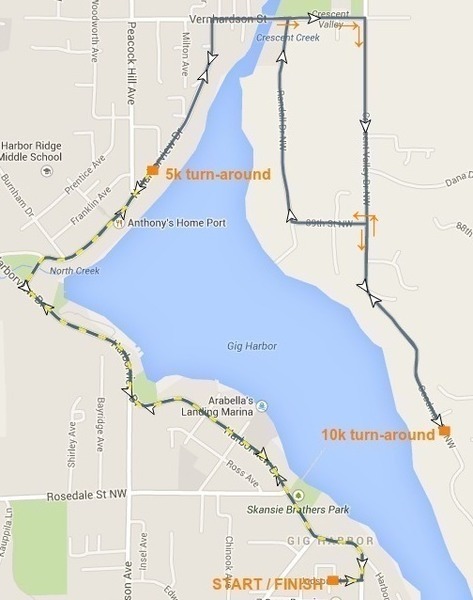 Registration for the 2019 Gig Harbor Turkey Trot is now OPEN! "[In 2003], Tim Holmes' son challenged him to run a marathon with him. Holmes, who own[ed] Holmes Chiropractic, accepted the challenge and started looking for training opportunities. 'I wanted to do something new, so I invited some of my friends and my patients to join me on Thanksgiving morning for a run. I thought it would be a good way to work up an appetite,' Holmes said. That first year, about 15 people showed up, he said, and the Turkey Trot was born. Now, he says, it has become something of a family tradition for a lot of people. 'We had 20 the second year, and it's just kept growing ever since.'" The trot begins at 8:00 am on Thanksgiving morning starting on the main road in front of the Gig Harbor post office (3118 Judson St). Please give yourself plenty of time before the race to drop off your cans of food and prepare for the race. You will be able pick up any race packets or preordered T-shirts. You can also pick these up at packet pickup the day before the race (details below under Race Preparations). Day-of-Race Registration starts at 6:30 AM. But please bear in mind that the registration fee is $30 on the day of the race as we want to enourage participants to pre-register well ahead of time to make for a quick and less-chaotic process on the morning of the race. Additional race T-shirts will also be sold both at packet pickup the day before the race and the morning of the race on a first-come, first-served basis. Sizes may be limited. The Start of both routes is in front of the Gig Harbor post office on Judson St. There will be volunteers along the way to guide you. For the latter half of the 10k, follow the orange arrows on the map. For the 5k, you will turn around approximately at the point on the map that says "5k turn-around". The end of both routes is at the starting line, in front of the post office. T-shirt and packet pickup day will be on Wednesday, November 21st from 1:00pm to 5:00pm in the St. Anthony Hospital cafeteria. Please do not bring canned food to the packet pickup as our volunteers do not have the means to transport food to the race. Please only bring food to the designated trucks on the morning of the race. Thank you. This year, proceeds are going to FISH food bank, a local organization called Food Backpacks 4 Kids, the Bischoff food bank, and local high school scholarships. 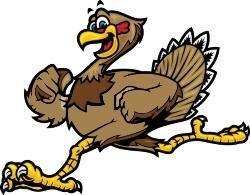 Start your turkey day right and join us in beautiful downtown Gig Harbor for a 5K or 10K race! Feel free to run or walk the course on your own or with family and friends.